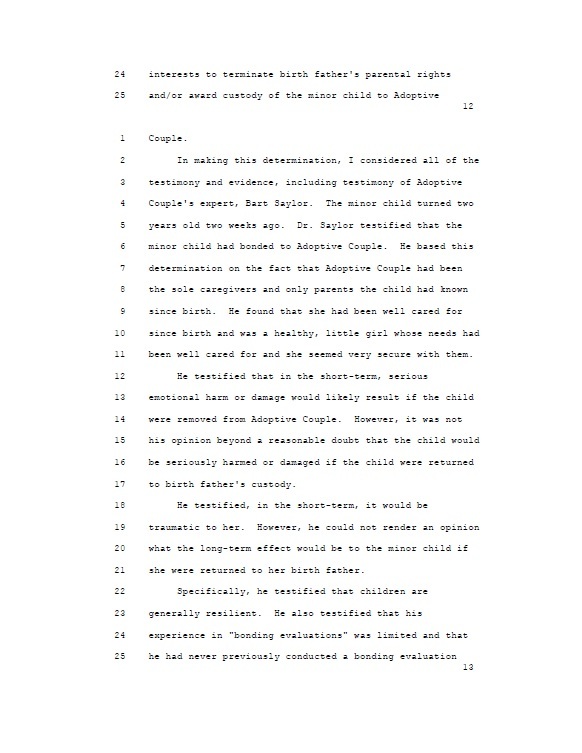 So how did we get from this “thwarted father” ruling to SCSC’s later determination of “abandonment”? THAT is the question that everyone should be asking themselves. Excellent post! 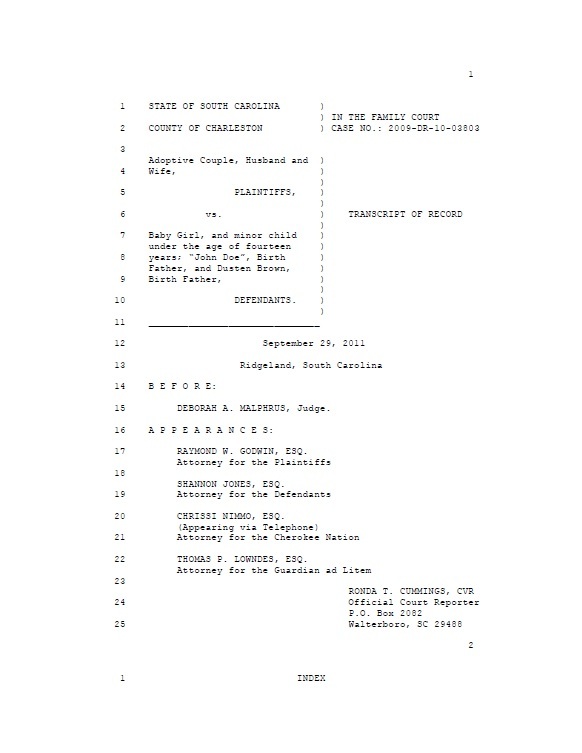 I often wonder what were the factors that changed the S. Carolina court’s position from 2011 to 2013. The only thing that I can think of is lobbying (or other informal influence) from unspecified parties. It just doesn’t make any sense. 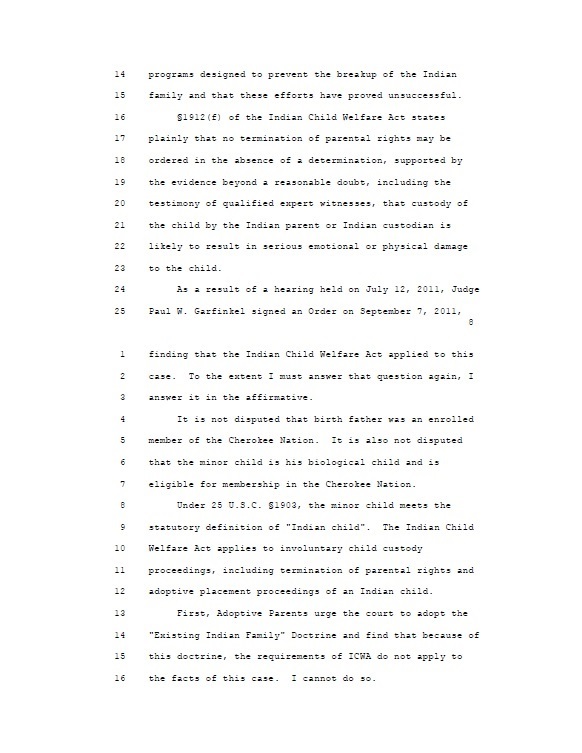 Unless, from a legal standpoint, the USSC invalidated the entire 2011 ruling, making all of the original findings (beyond ICWA) moot. There is most definitely a disturbing “disconnect” between 2011-2013. 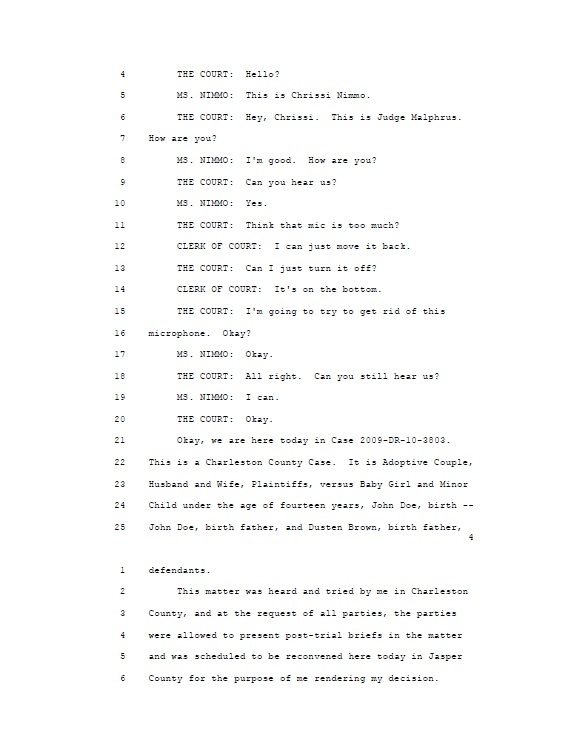 As we already known of the heavy lobbying influences of CAICW/Elizabeth “Lisa” Morris (Christian Alliance for Indian Child Welfare) and Quad A (American Association of Adoption Attorneys) and the “big money” factors both have so liberally contributed, this case literally reeks of undue influence, abuse of judicial discretion, and legal error. 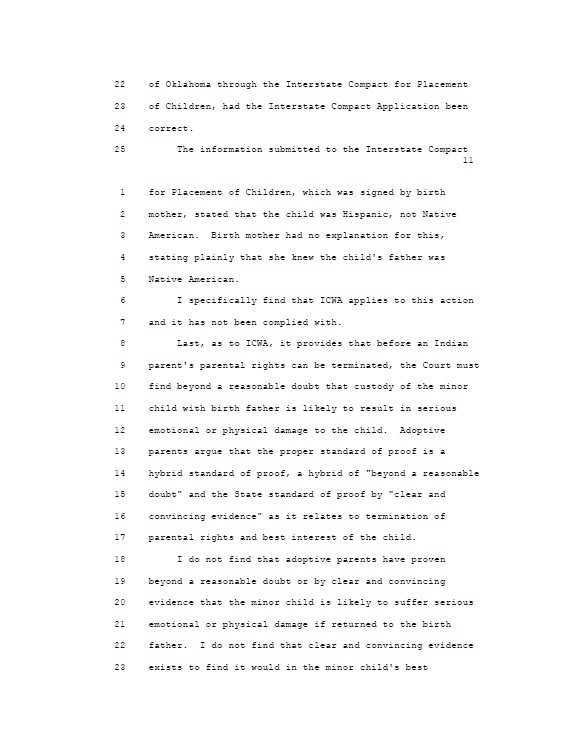 CAICW wants to gut and/or destroy ICWA so as to free up more NA children for adoption. Quad A wants to reduce the protection provided to ICWA fathers to those of non-ICWA fathers. 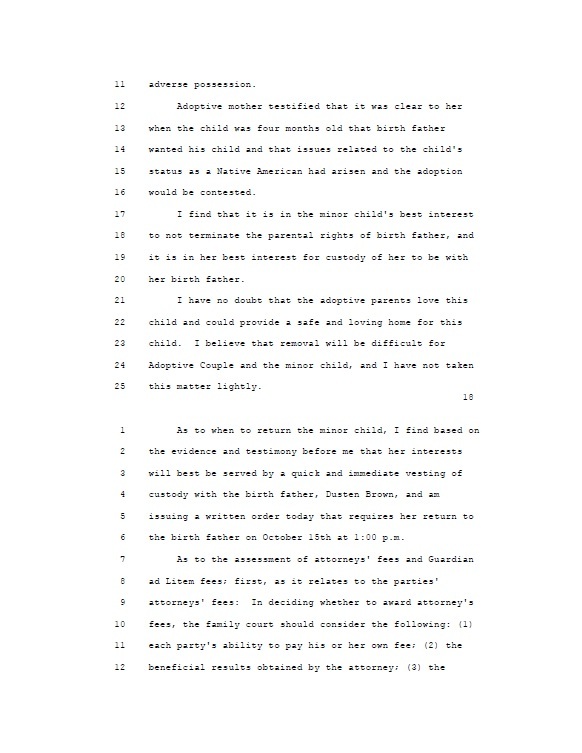 Non-ICWA fathers rights are already, in practice, almost non-existent. The end result is simple: more fit and loving fathers (ICWA or not) will have their children stolen in plain sight under the auspices of “adoption”. We firmly believe whether biased or not, this is the way they would have liked to rule in the first place. 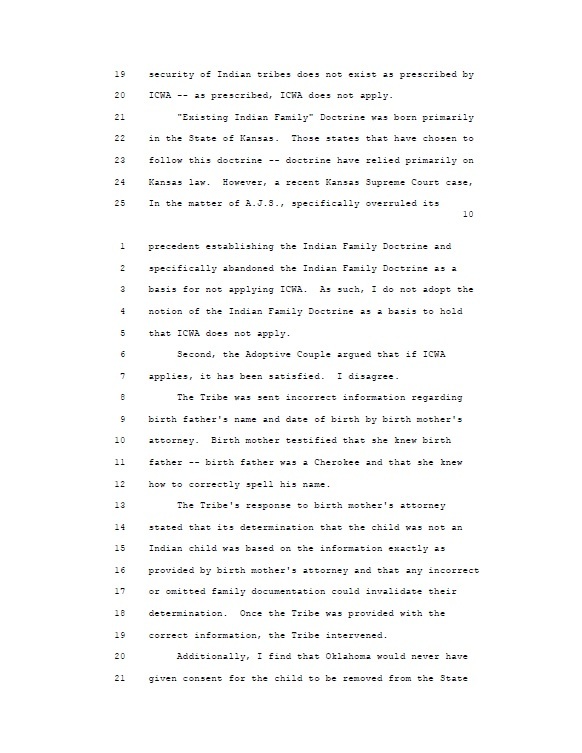 They wrote as much in the USSC ruling when they began “It is with heavy hearts…” Sadly, it seems the only thing keeping them even slightly fair at that time was ICWA. Once that was out of the way, they were free to be as biased, as unjust and as slick as they wanted to be. Remember, we haven’t said this is the last you will see from us. We’ve seen much more that leads us to believe this whether currently published or not. I don’t understand all the legal wranglings of this case but, what I do know is, I am absolutely heartsick for this father and his beautiful little girl:( She needs to be with her daddy. I think what happened to this father is a terrible thing, the same thing happened to my brother years ago and I think it was this same woman she is having babies and making money the fathers know nothing until it is too late. 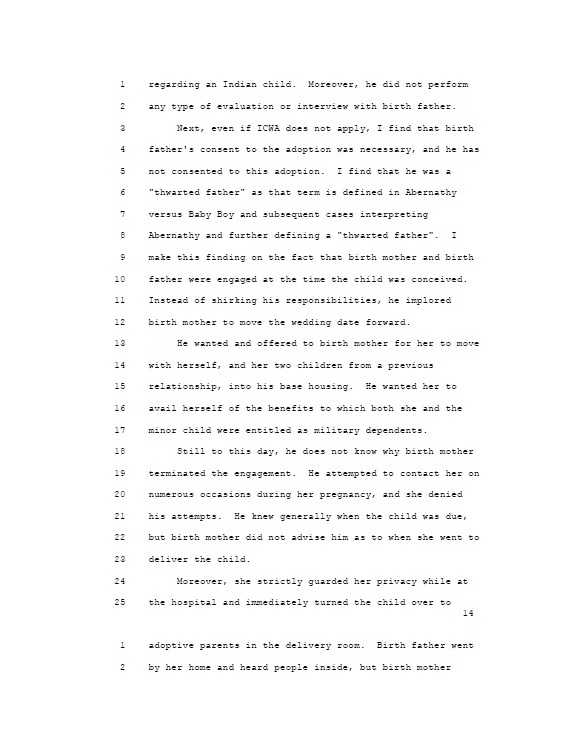 The law should be that they have the same amount of time to make up their minds about how to make things work for the child, that the mother had 9months, and her intentions were never to keep her child but to make money. 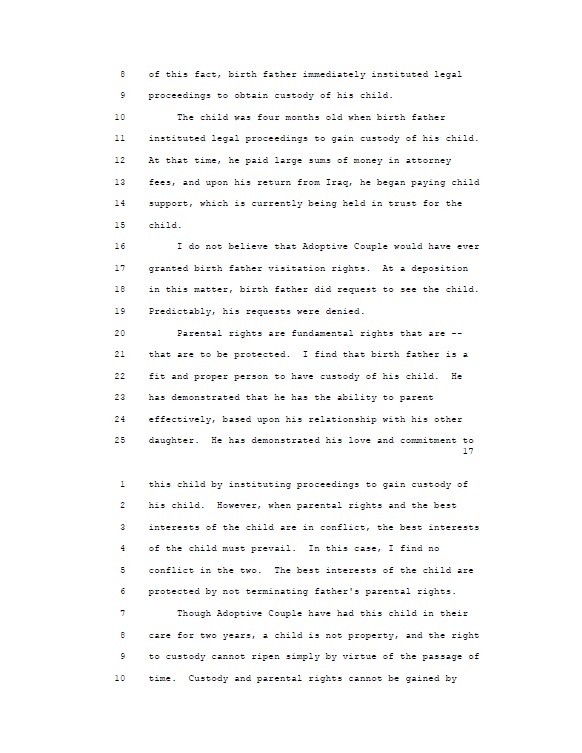 It is unlawful to tell the father after the baby is born and adopted that he has a child he knew nothing about, the mother had 9months to prepare and the father is thwarted. 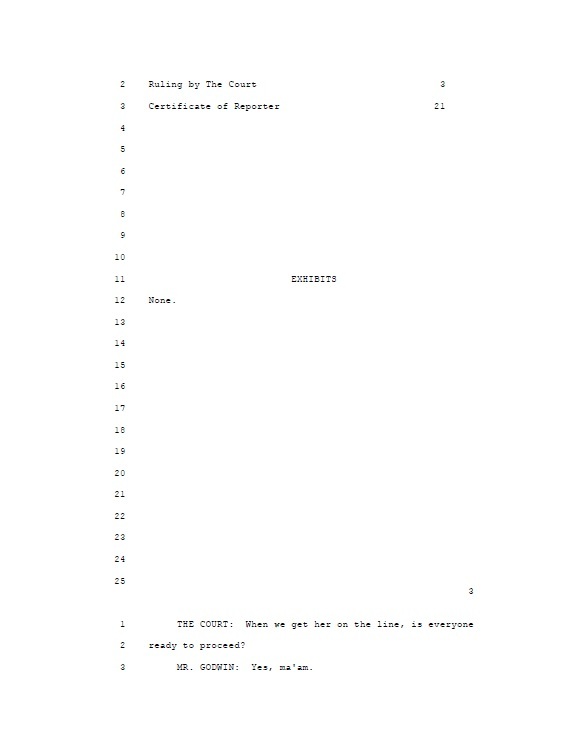 It is a crime and that it is happening in the USA makes us look uncivilized, simply a case of greedy women and lawyers. In addition, Dusten Brown was penalized for being an active duty service member serving in a war zone, instead of being given extra recognition and thanks from a grateful nation. 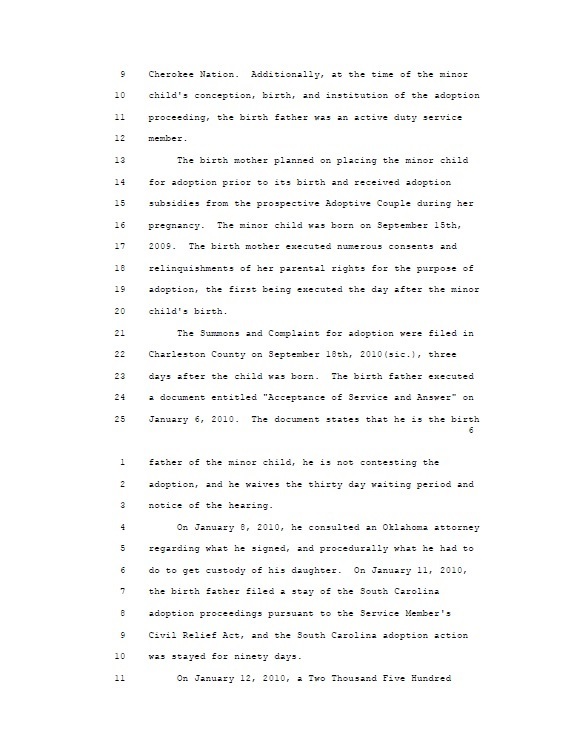 There are laws that are supposed to protect the rights of biological parents serving in the military, but they too were not properly followed in this case. 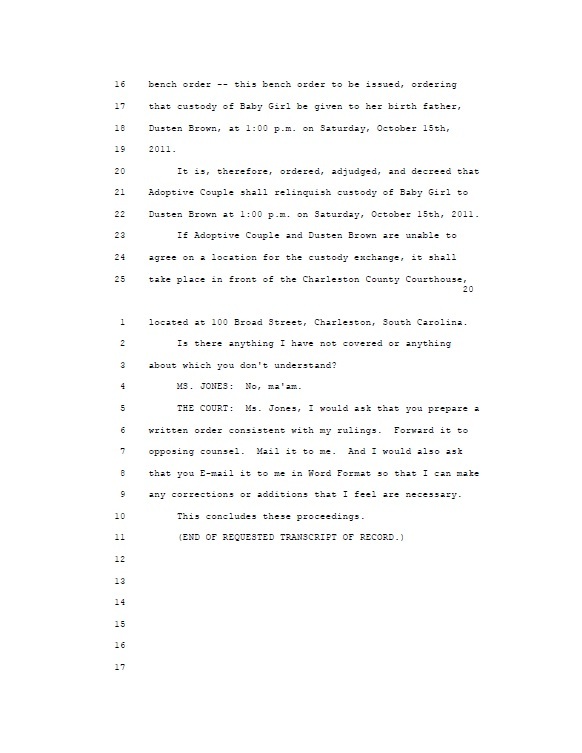 By the way, South Carolina is a state with laws that are particularly unfair to biological fathers, which is why biological mothers seeking to profit from putting their babies up for adoption find it advantageous to adopt to South Carolina adoptive parents, since there is less chance that the father will successfully intervene. 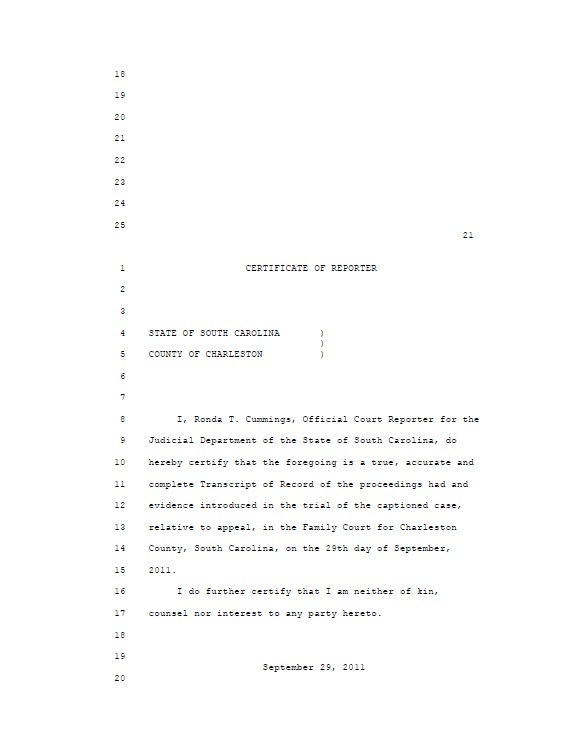 However it is not clear that South Carolina courts ever had jurisdiction in this case, because the baby girl was moved from Oklahoma to South Carolina in violation of federal law for transporting children between states for the purpose of adoption. 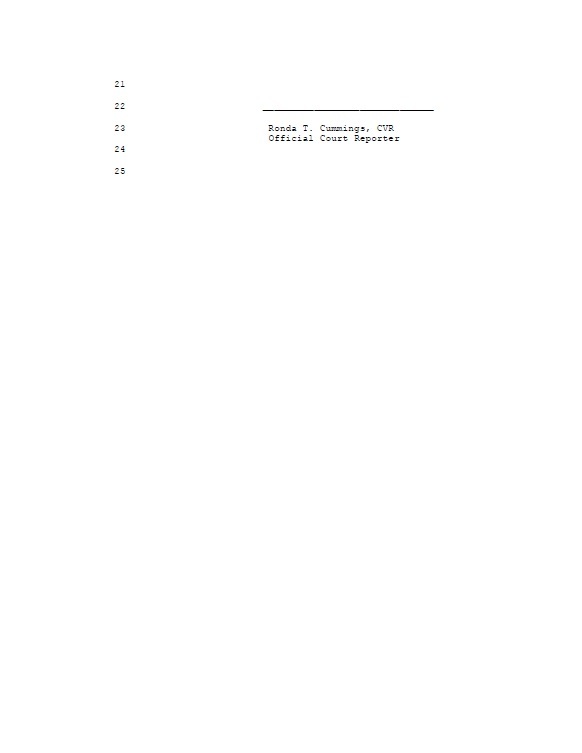 The question of jurisdiction can be raised at any time in most legal matters, because if a court does not have jurisdiction then any decision it makes in the matter is moot. 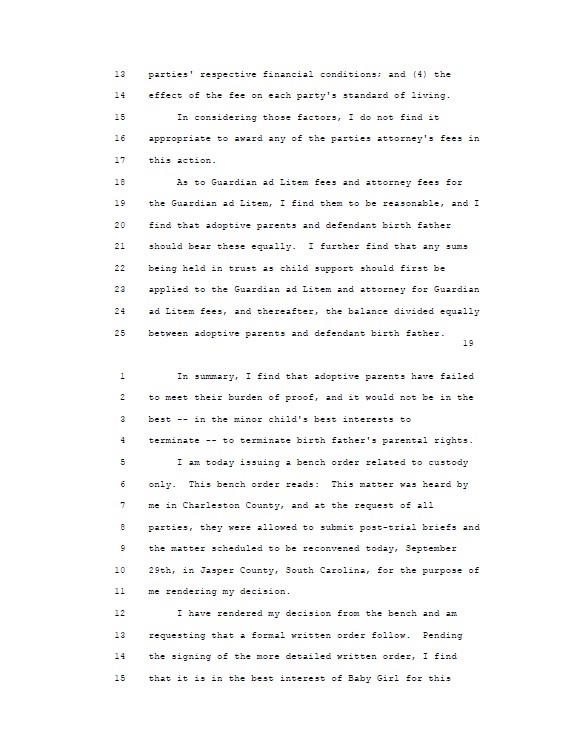 So it may be that in the long run the South Carolina adoption decision can be set aside as having been made by the wrong court to handle the case. 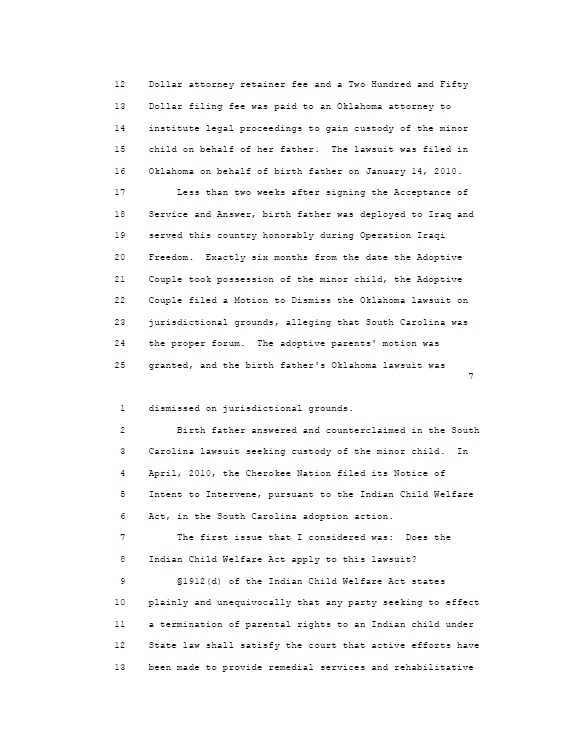 In that case, the custody of Ronnie Brown would have to be decided either by the state of Oklahoma, or more probably by the tribal court of the Cherokee Nation. 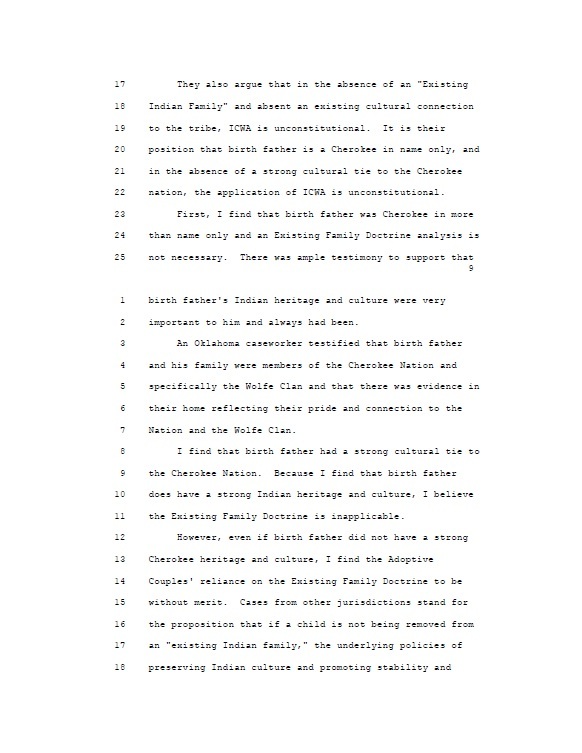 It is possible that either the Oklahoma state court system or the Cherokee Nation tribal court system would not award custody to Dusten Brown but it is much much less likely that they would award custody elsewhere because either set of laws treats biological fathers who want to raise their own children and are fit parents much more favorably than South Carolina does. 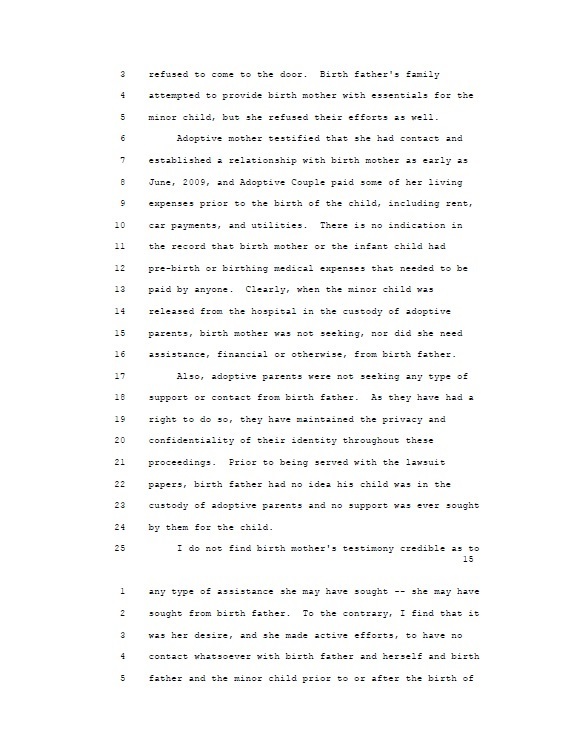 So the questionable legality of the process of how Ronnie Brown was removed from Oklahoma using information that was known to the birth mother to be false, and probably known to the birth mother’s lawyer to be false, and that certainly would have been known to the birth mother’s lawyer to be false if the lawyer had exercised due diligence, which she is obligated by the rules of professional conduct to do. 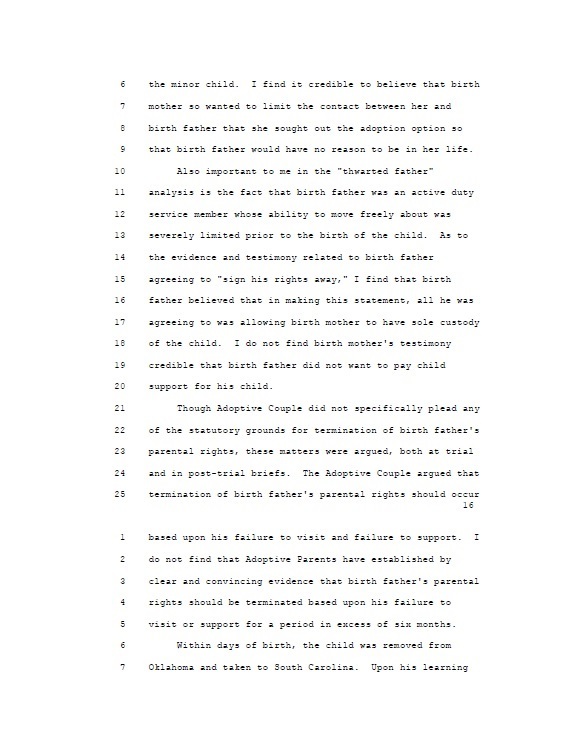 So the birth mother’s lawyer may also be at risk of being sued for malpractice or disciplined by the state body responsible for overseeing the conduct of lawyers in Oklahoma. This situation is probably far from over. Ronnie Brown may yet come home again long before she is grown. I certainly hope so for her sake. Dusten Brown sounds like a much more appropriate and caring parent. The adoptive couple sound extremely selfish trying to adopt a child with a fit and loving biological parent and a fit and loving extended biological family. Why isn’t adoption only allowed where there is no biological family willing and capable raising the child? Why in the world would our laws even consider Ronnie Brown available for adoption, or any child with a similar loving and capable family. If the adoptive couple wants to adopt, they should adopt a child that needs a home, not one that has a good home, regardless of the exact situation. I am not adopted, and I know how much it matters to me knowing whom I am related to, and where I come from. It should take an extremely bad situation in the biological extended family for any child to be available for adoption outside the extended family. Even if Dusten Brown had not turned out to be the excellent father that he is for Ronnie Brown, at the very least his parents and other near relatives that love her should have been given strong preference for adopting her and raising her in her family of origin. Our family and our family history is an important part of all of us and should not be lightly stolen from us.